Last month I got an email about an opportunity/contest to "Design a show-stopping shawl for Stevie Nicks". I was immediately inspired & began work on it right away ~ here's the finished result! Voting starts today! I'd love if you could go take a look, and vote if you feel moved to do so :) Many beautiful/sentimental/artistic pieces have been made or sketched for this, and I hope Stevie (& everyone!) has a wonderful time going through all of the pieces she's inspired. I can definitely see you wearing a shawl like this at our (future-someday) spooky home by the sea ~ sitting outside having tea, wearing our giant festooned velvet witch hats. Thank you so much for voting ~ I really loved making it! Voted! Personally, having looked at all the entrants - I don't see how you could NOT win! needless to say I voted. and it's magnificent! Wow, that is so amazingly gorgeous! I'm sure you'll get a lot of votes, I put mine in! 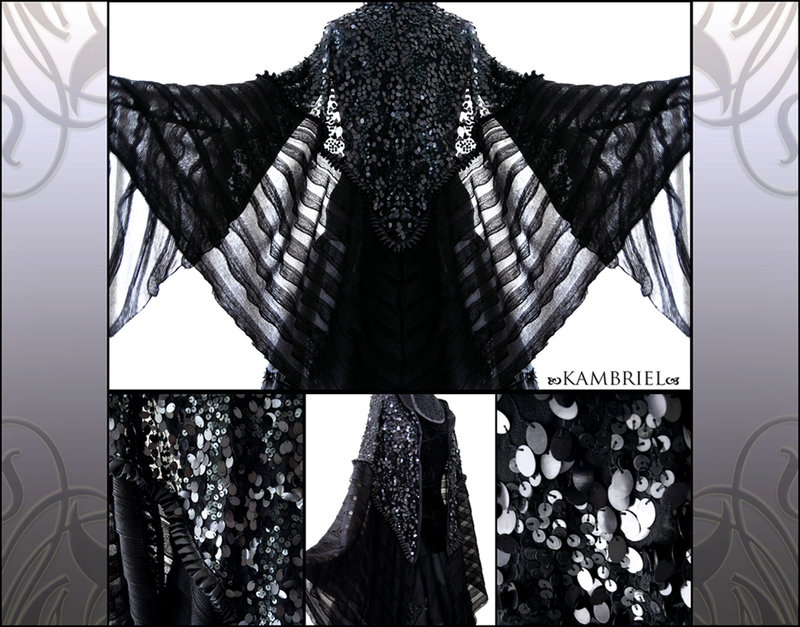 *facepalm* In my haste to share the post, I totally forgot to say how absolutely breathtakingly gorgeous the shawl is -- worthy of bedecking Stevie herself, or a fashion-conscious dark goddess of the night! P.S. Did you see the Stevie pics that jola had posted about? I'd read about those self-portraits, hadn't seen those yet, so thanks for sharing them! I remember her saying something about telling people to show up bedecked in lipstick, lace, hats, etc... in the middle of the night for photos, and people just didn't seem to take her up on the offer ;) It's funny, because I'm normally the person doing that to my friends whenever the opportunity arises! Hehe -- that is awesome!! Wish you were local, I'd love to play dress-up and take photos! The winters in the DFW area are generally quite mild, although Jan/Feb seem to have the highest chance of having snow or ice. Even when we get ice, it doesn't last -- but it's quite treacherous when it's on the roads, since they don't have a salting/sanding infrastructure here. Annnd I just remembered that you've lived in Texas, never mind . . . I'm trying to do three things at once (one of which is "making calls for Kira's Social Security stuff," I'm on hold), and it's making me really ditzy today!! But! Yes! You totally should, someday when it's feasible! Sp00ky sleepovers are amazing!! That is beautiful! I hope you win! Even if you don't win, you've still made something beautiful. My hat's off to you.